For other uses, see Porus (disambiguation). Porus (IPA: [porus]) or Poros (from Ancient Greek: Πῶρος, Pôros), was an ancient Indian king whose territory spanned the region between the Hydaspes (River of Jhelum) and Acesines (Chenab River), in the Punjab region of the Indian subcontinent. He is credited to have been a legendary warrior with exceptional skills. Porus fought against Alexander the Great in the Battle of the Hydaspes (326 BC), thought to be fought at the site of modern-day Mong, Punjab, which is now part of the modern country of Pakistan. Though not recorded in any available ancient Indian source, Ancient Greek historians describe the battle and the aftermath of Alexander's victory. After the defeat and arrest of Porus in the war, Alexander asked Porus how he would like to be treated. Porus, although defeated, being a valiant, proud king, stated that he be treated like how Alexander himself would expect to be treated. Alexander was reportedly so impressed by his adversary that he not only reinstated him as a satrap of his own kingdom but also granted him dominion over lands to the south-east extending until the Hyphasis (Beas). Porus reportedly died sometime between 321 and 315 BC. Surrender of Porus to Alexander, 1865 engraving by Alonzo Chappel. Porus's elephant cavalry as depicted in the 16th century German work, Cosmographia. The only information available on Porus and his kingdom is from Greek sources. The Indian sources do not mention him, although modern scholars have conjectured that he may have been a ruler of the Purus, a tribe known to have inhabited north-western India since the Vedic period. Some scholars, such as H. C. Seth, have attempted to identify Porus with Parvataka, a king mentioned in the Sanskrit play Mudrarakshasa, the Jain text Parishishtaparvan, and some other historical sources. However, there is little concrete evidence to support this theory: the Mudrarakshasa describes Parvataka as a mlechchha or non-Vedic foreigner, while the Purus were a Vedic tribe. According to the Parishishtaparvan, Parvataka ruled Himavakuta, while Porus ruled in the present-day Punjab region. According to the Mudrarakshasa, Parvataka was killed by a vishakanya (poison girl) as a result of an intrigue by Chanakya, while the Greek sources state that Porus was killed by Eudemus. The Achaemenid Empire occupied the western Indus basin since the conquests of Darius the Great. Neither the occupying Achaemenid nor local native sources confirmed the existence of Porus' Kingdom at the time. Following the fall of the Achaemenid Empire, Porus and other regional powers contested for the land left behind. According to historian Ishwari Prasad, Porus might have been a Yaduvanshi Shurasena. He argued that Porus' vanguard soldiers carried a banner of Herakles whom Megasthenes—who travelled to India after Porus had been supplanted by Chandragupta—explicitly identified with the Shurasenas of Mathura. This Herakles of Megasthenes and Arrian has been identified by some scholars as Krishna and by others as his elder brother Baladeva, who were both the ancestors and patron deities of Shoorsainis. Iswhari Prashad and others, following his lead, found further support of this conclusion in the fact that a section of Shurasenas were supposed to have migrated westwards to Punjab and modern Afghanistan from Mathura and Dvārakā, after Krishna walked to heaven and had established new kingdoms there. Meeting of Porus and Taxiles, a 20th century artist's imagination. The Battle of the Hydaspes was fought in 326 BC by Alexander the Great against King Porus, on the banks of the river Hydaspes. The battle resulted in a Macedonian victory. Alexander was greatly impressed by his adversary and not only reinstated him as a satrap of his own kingdom but also granted him dominion over lands to the south-east extending until the Hyphasis (Beas). After Alexander's death in 323 BCE, Perdiccas became the regent of his empire, and after Perdiccas's murder in 321 BCE, Antipater became the new regent. According to Diodorus, Antipater recognized Porus's authority over the territories along the Indus River. However, Eudemus, who had served as Alexander's satrap in the Punjab region, treacherously killed Porus. SET launched Siddharth Kumar Tewary's serial titled Porus on the Battle of Hydaspes in Nov 2017, in which Porus is portrayed by Laksh Lalwani. 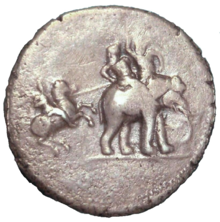 ^ See Keyne Cheshire, Alexander the Great (Cambridge University Press, 2009), p.139: "Alexander charges Porus, who hurls a javelin from atop his elephant"
^ Nonica Datta, ed. (2003). Indian History: Ancient and medieval. Encyclopaedia Britannica / Popular Prakashan. p. 222. ISBN 978-81-7991-067-2. Not known in Indian sources, the name Porus has been conjecturally interpreted as standing for Paurava, that is, the ruler of the Purus, a tribe known in that region from ancient Vedic times. ^ H. C. Raychaudhuri (1988) . "Indian in the Age of the Nandas". In K. A. Nilakanta Sastri (ed.). Age of the Nandas and Mauryas (Second ed.). Delhi: Motilal Banarsidass. p. 147. ISBN 978-81-208-0466-1. ^ Irfan Habib; Vivekanand Jha (2004). Mauryan India. A People's History of India. Aligarh Historians Society / Tulika Books. p. 16. ISBN 978-81-85229-92-8. ^ "Siddharth Kumar Tewary's next on Porus for Sony Entertainment Television". Times of India. Retrieved 23 July 2017. Chisholm, Hugh, ed. (1911). "King Porus" . Encyclopædia Britannica (11th ed.). Cambridge University Press. This page was last edited on 23 April 2019, at 02:14 (UTC).